TV shows with a grand scale of production and a story timeline not in sync with the real world are prone to some production errors of various kinds. Heroes is no exception. At the end of Don't Look Back, Hiro returns from the future to the Tokyo subway car where he left at the end of Genesis. The filming of this scene involved blue-screening due to the transition between the explosion approaching the police station and Hiro standing in the subway. However, the shot of the subway used in the blue-screen background already includes Hiro with his arm raised, gripping a safety bar. In the scene where Hiro is being interrogated by the police for allegedly killing Isaac, there is a typographical error in the subtitles. After "If you let me make a phone call" appears, watch out for "my English speaking friend will clear everthing up." When D.L. and Jessica are fighting, D.L. appears to be choking her in one frame, then, when the perspective switches he is not, then he is again with the next perspective switch. Takezo Kensei's name is spelled "Takezo Kensai" in the translated subtitles, even though the display case at the Museum of Natural History spells his name "Kensei". In all subsequent episodes, it is spelled as "Takezo Kensei". Mohinder's facial hair changes between scenes from short and thin to short and thick. When Matt tries to shoot Sylar, four distinct gunshots can be heard (although five bullets can be seen discharged from the gun). When the camera shifts, a total of five bullets can be seen in mid-air. When the camera shifts again (facing Sylar) only four bullets hover in mid-air. Also, in Four Months Later..., Matt tells Detective Fuller that four bullets to the chest would not stop him. When Matt asks Molly if she had any more nightmares, her response, "no", is dubbed in. When talking to Micah at the table, Niki says "we cannot waste another nanosecond", but this was clearly dubbed in. When Future Peter comes to the bank to rescue Peter, the sound of his footsteps do not appear to match his actual movements. When Future Knox is holding Gabriel's son captive, in one frame he is holding him around the neck, then at arm's length in the next frame, then back around the neck in the following frame. In a particular scene where Peter and Sylar were fighting in a Level 5 cell, Peter shouted "no!" before snapping Sylar's neck. Between the 2 actions, Angela can be seen hurrying into the cell. The reflection on the glass plate shows Peter turning his back already. When the scene cuts back to Peter, he had just turned around and did the exact same thing in the reflection. When Elle is standing outside of the Pinehearst Company with Claire, a breeze exposes the area of her forehead which Sylar sliced in The Butterfly Effect, yet there is no scarring. As Sylar prepares to cut Elle's head open, her hair has fallen over her forehead. However, as he begins cutting, Elle's hair is smoothed back behind her ears. A cameraman and his camera can be seen reflected in the formula in the Pinehearst laboratory. In the final scene of episode Building 26, The Motel bartender said "mm mm" while shaking her head after Noah asks her if she knows any open apartment. While in the re-enactment of the opening scene in episode Cold Wars, she said "No", instead of just shaking her head. Many variations of the 9th Wonders! comic are present in multiple episodes. Mohinder has a Vehicle Operations License. The license is valid until 02/30/2007. The address on the Cadillac's registration (37 Parker St) doesn't match the street number on Niki's curb (9734). According to the registration, Niki's car is a '66 Caddy convertible with a V-8. The tail fins do not match the stock versions of either the DeVille or the Eldorado, the only two series offered in a convertible that year. In reality, the car is a 1959, not a 1966. Again, it's unclear whether this is an oversight or a clue. The license number on Niki's car (329OCX) does not match the number printed on her registration (307RTH). The NYPD detective in Isaac's apartment notes that Hiro is a member of the "Merry Marvel Marching Society", a Marvel Comics fan club that was disbanded in 1971. Given that Hiro's age is given as 24, he would have had to have joined eleven years before he was born. Of course, Hiro's a big enough comic fan that it's possible he made his own membership card. The jacket images for the book Activating Evolution prop used in Heroes actually shows two different actors as Chandra Suresh, one in more western style clothing and one in the traditional Indian wardrobe. The photo with the turbanned Suresh is from the promo shown before Collision. The photo with Erick Avari as Suresh is from the aired version of One Giant Leap. At Peter's celebration party, one of the songs he plays is "Smile", by Lily Allen. This song wasn't actually released until September 2006. Jessica and Micah are shown playing Heavenly Sword for the Playstation 3. However, the episode takes place in late October or early November 2006, before the Playstation 3 was released (on November 17, 2006), and Heavenly Sword wasn't due for release until September 12, 2007 in the United States. On Peter's passport, it shows one category with the designation as "F". In an interview, Aron Coleite and Joe Pokaski confirmed this was merely a production error. 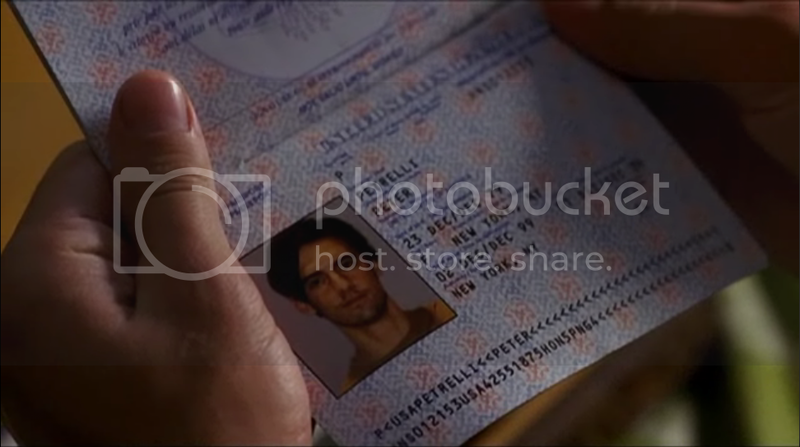 A replacement scene was shot with a corrected passport, but was not used, although Aron and Joe state that it will be corrected for DVD. There is a new model iMac , which was released on August 7th 2007, in Victoria's house, but this episode took place on March 19th 2007. The New York Chronicle Article states LOCAL MAN WANTED IN MOTHERS MURDER without an apostrophe. Additionally, newspapers do not show photographs of bodies at the murder scene, and they would have cropped the photo of Gabriel. As Angela speaks to Nathan on the phone, she looks at a file with a picture of Danko and a newspaper clipping, the headline of which reads Civilain Deaths Reported in Angola Coup. "Civilian" is misspelled. The issue of X-Men Hiro references, #143, does not actually contain the story he cites. He was referring to Days of Future Past, which appears in issue #141 and #142, however it is very much possible he just miscited a comic. In a television news report on KVFD, it is mentioned that the train was registered to the Nuclear Regulatory Commission, but there had been no official statement as to what was the train's cargo. Interestingly enough, the U.S. Nuclear Regulatory Commission owns no trains, planes, or boats in reality. In fact Eliot Brenner, who works in the Office of Public Affairs for the Commission, complained of the inaccuracy. In response, Oliver Grigsby suggested that perhaps Laura Lancaster was wrong in her report. A total solar eclipse being a world wide event is impossible. Ando suggests to Niki that she should make the WHOIS information for lasvegasniki.com private. In reality, the actual WHOIS information for lasvegasniki.com is private, through DomainsByProxy. Audrey claims that CODIS database determined the identity of the seared fingerprint found on Robert Fresco's body when in reality, she would actually be using the AFIS (Automated Fingerprint Identification Systems) database. CODIS (Combined DNA Index System) is used to determine the identity of a person using his or her genetic material, such as hair, blood, etc. Sheriff Davidson's crossword puzzle uses "Kanyakumari" as the answer to a clue about Gandhi's burial place. Kanyakumari is not actually Gandhi's "burial place". Gandhi was cremated and his ashes were immersed in major rivers around the world. However, there is a monument in Kanyakumari, the Gandhi Mandapam, on the site where his ashes were kept on public display. Sylar slices Jackie's head open much faster than he has with any of his other victims, and she bleeds much more profusely than is humanely possibly. Hiro says he took the bus when Ando asks if he teleports. It is impossible to take a bus from Tokyo to Texas. Hiro invites Charlie to a "24-hour samurai-film festival at the Drafthouse in Austin". The Alamo Drafthouse Cinema does not actually hold a Samurai film festival. Mohinder tells Bob that combining his own blood with Claire's causes his antibodies to become strong enough to defeat an enhanced strain of the Shanti virus. In reality, though, antibodies, being proteins and not cells, cannot "become stronger". Since they are simply molecules that interact with antigens such as viruses, they cannot be "strong" nor "weak". Gretchen tells Claire that strange attractors are physical particles that shouldn't be together, but when they do, they become "super-strong". In reality, though, strange attractors are a mathematical concept related to chaos theory. Claire learned she was adopted in 2003, though she once said that she had learned she was adopted when she was very young (One Giant Leap). While Powerless indicated that Sylar regained his abilities in an alley in NY after Nathan was shot, when Claire is watching a live transmission about the shooting Sylar is already there in Costa Verde. Nathan's first vision of Linderman appears to occur before Maury escaped Level 5. Claire did not get drunk while consuming wine. However, Adam Monroe, also known as Kensei was obviously drunk in Lizards. This is obviously an error as both Claire and Adam have the same ability. However, this may be explained by the fact that Monroe had not yet discovered his ability when he was drunk. When Claire talks to Noah and Nathan about the last book they read, she was holding the cover of Alice in Wonderland in her right hand. When the shot changes immediately to a different angle, she is holding it in two hands. There are conflicting references as to Claire's age and birthdate. Before production began, a press release noted her age would be 17. In the televised episodes, a newspaper article reported Claire's age as 18 months during the fire on February 28th 1992, which would put her birth in August of 1990, and her age as 16. In The Fix (which takes place in October 2006), Claire says she is "almost 16"; this would suggest that her birth was in or after October of 1990. Further, Claire's birthmother tells Nathan that their daughter is now 16 (Run!). Claire is a junior (Distractions, Four Months Later...), and most juniors are 16 or 17. Her MySpace page indicates her zodiac sign as Aries (which would place her birthday between 21 March and 19 April) and her age as 19. In the commentary for Godsend, Jack Coleman states that Claire has just turned 16. In an interview Tim Kring stated that Claire is 16. At the 2007 San Diego Comic Con, Hayden Panettiere said her character is 15. Incidentally, Claire does drive (Collision); and the legal driving age in Texas is 16, though a driver can obtain a permit at age 15. In March 2007, Mr. Bennet gives Claire a Nissan Rogue for her birthday, which they note is "next month" (April 2007). The extent of Daphne's power in relation to Hiro's doesn't quite seem to add up. Ishi Nakamura was shown to have died in 1990 (Cautionary Tales), and Claire Bennet was shown to have been given to Noah in 1992 (Company Man). The Eclipse, Part 2 and Our Father show the latter happening before the former. Elle Bishop was shown to be in Odessa, Texas, watching Claire on the day of the first eclipse. (Elle's First Assignment, Part 2). However, in Villains she is talking to Noah about Sylar in New York, moments before Peter gets into Mohinder's taxi to witness the same eclipse. In an interview, Joe Pokaski and Aron Coleite said that Peter only has access to one power at a time. However, Peter has clearly demonstrated his proficiency at using multiple powers simultaneously on more than one occasion. In an interview, Joe Pokaski and Aron Coleite commented on Daphne's power: "I brought up the mass = force times acceleration argument, but some people just don't believe in physics." However, mass equals force divided by acceleration, not multiplied by it. This page was last modified on 10 June 2010, at 11:47.